Former Philadelphia 76ers president Sam Hinkie often preached that progress isn’t always linear. The premise being that leaps in success for both players and teams can sometimes prove exponential rather than gradual. It’s no longer surprising when the former Lehigh Mountain Hawk produces a game-swaying, or even slate-shifting, scoring performance, such as Tuesday night’s 40-point effort in an emboldening win over the Milwaukee Bucks. The big game marked McCollum’s fourth career 40-point effort, as he now as at least one such performance in each of the past three seasons. Nineteen of his 40 points came in the third quarter, tied for the third-most points in a quarter in his career. It also helps for entertainment purposes that McCollum shook rookie Donte DiVincenzo with a brilliant crossover last night. With McCollum’s statistical stock already highly valued by the fantasy market, let’s pivot to a third-year breakout candidate again living up to Hinkie’s maxim. 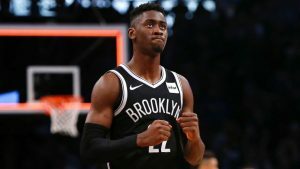 Brooklyn’s Caris LeVert tallied 26 points on 16 shots in a win over the Suns in Phoenix last night, giving him his third straight 20-point game, the longest streak of his young career. Signaling the fantasy market hasn’t yet fully bought into LeVert’s ascent, he’s rostered in 62.2 percent despite being one of just nine players to average at least 20 PPG, 1.5 SPG and 1.5 3PG. His peers in this unique performance tier? LeBron James, Kawhi Leonard, Victor Oladipo, Jimmy Butler, Paul George, James Harden, John Wall and Donovan Mitchell. Even as LeVert is likely rostered in most competitive 10-team fantasy leagues, acquiring this rising scoring wing via trade likely won’t cost much, especially when considering the fantasy impact of his performance and usage peers. With an eye on meaningful fantasy performances and relevant statistical trends, let’s delve into the night that was in the NBA.